In the US alone, mining is a $97 billion industry that employs over 1.6 million people every year. Mining companies are always looking for ways to streamline production and lower maintenance cost for their specialized equipment. At Nylatech, we've worked in partnership with our distribution partners to produce wear resistant components to reduce equipment maintenance costs and extend the life of mining equipment. For example, we work with materials that contain solid lubricant additives (meaning start-up or running lubrication is no longer required), that have high pressure-velocity, and excellent wear resistance. We provide cast nylon parts for mining equipment where sliding, rolling, abrasion, or impact could cause significant wear. 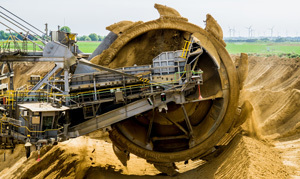 When mining equipment parts are made to last, the need for machine maintenance is reduced for that part and other pieces it comes in contact with. It’s often difficult and costly to halt operations to fix or replace a small part so part durability will save time and money! If you'd like to learn more about cast nylon parts for mining equipment, we want to hear from you.